Target was founded in 1902 as Dayton Dry Goods. In 1962 Target opened their first store. Today, Target is the 2nd largest discount retailer in the US (Walmart being the largest). In 1999 Target.com launched its website which features many exclusive items. Target.com's daily deals page spotlights one main item and multiple side deals -- all at discounted prices. The deals last for 24 hours or until they are sold out (whichever comes first) and the shipping is free. 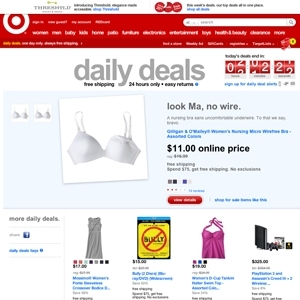 Target.com currently ranks #5 amongst sites offering online deals -- Best Buy ranks #4. In the General Merchandise category, Target ranks, once again at #5 -- Bestbuy.com again ranks slightly higher and the same as before, at #4.